Ships today if you order in the next 9 hours 20 minutes. 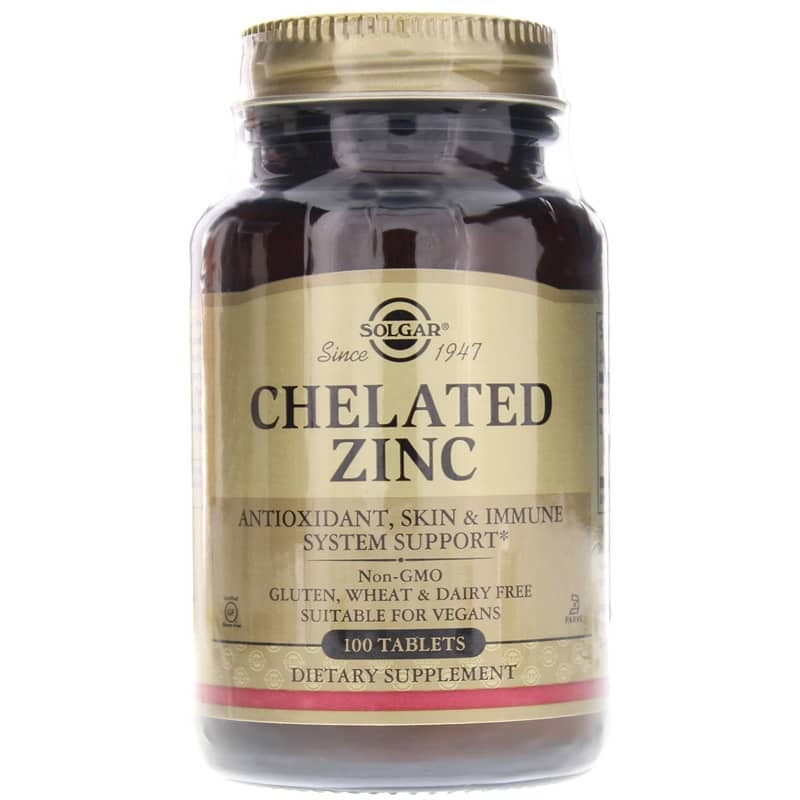 Chelated Zinc Tablets from Solgar is a patented chelated form of zinc that helps to promote optimal absorption for antioxidant, skin and immune system support. Zinc promotes healthy skin, hair and nails, supports normal taste and vision, and promotes the synthesis of collagen in bone tissue. It also supports cell growth and DNA formation. It exerts antioxidant activity and can support a healthy immune system. Other Ingredients: Microcrystalline Cellulose, Dicalcium Phosphate, Vegetable Cellulose, Silica, Vegetable Magnesium Stearate, Vegetable Stearic Acid. Contains NO: Gluten, Wheat, Dairy, Soy, Yeast, Sugar, Artificial Flavor, Sweetener, Preservatives and Color. **Solgars Chelated Zinc Tablets are manufactured under license agreements with Albion Laboratories whose patents and pending patents cover the complexing of minerals with pure amino acids. Adults: As a dietary supplement for adults, take one (1) tablet daily, preferably at mealtime, or as directed by a healthcare practitioner.